During 2015, Monsanto started looking for ways to contribute to the smaller production unit farmers in the agricultural sector. It is already clear that the demand for food for the next 2 - 3 decades will need to be addressed now. For that reason it was decided to focus on this market segment and more specifically, on technology and affordable hybrids with a high yield potential. In collaboration with other agricultural organisations we would like to ensure that this potential is realised sooner than later and have already started to approach individuals and communities in this regard. The success of grain production on smaller units will be determined by the potential of those units to contribute to economy of scale. Monsanto is committed to face the challenges around this and to find solutions. Small commercial – >75 ha/250 ton grain, mechanised. Small scale farmer – 10 ha -75 ha, partly commercial, little to no mechanisation. 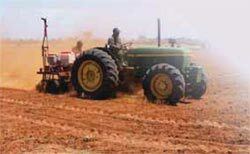 Subsistence farmer – 1 ha - 10 ha, full production involves hand labour, own use. This is the group of farmers that needs to be empowered to contribute to the food production capacity that could support the worlds' population. Monsanto have already started various project under the guidance of Mr Leonard Oberholzer (Agriculturalist division). Mr Jako Benadie (Agriculturalist, Ermelo) drives these projects and is responsible for the implementation and data capturing. One of the main challenges that needs to be addressed is the perception of a high yield which some of the older hybrids show, while there is new genetics available in the market that is doing much better and also shows stronger resistance to environmental factors. For this reason Monsanto is interactively involved with the NEW ERA FARMERS and are looking for ways to offer the newest technology and the best hybrids to the farmers who will feed the world population in future. Article submitted by Magda du Toit, Corporate Communication Manager, Monsanto South Africa. For more information, send an email to magda.du.toit@monsanto.com.